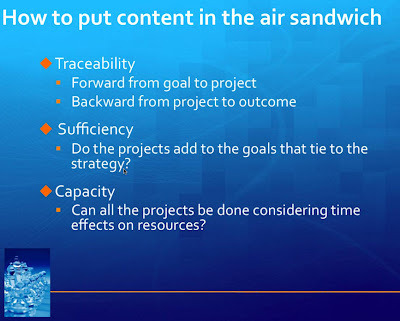 ProjectWorld and World Congress for Business Analysts: Filling the "Air Sandwich"
I recently had the pleasure of moderating another one of our Project World and The World Congress for Business Analysts year-round webinar series. Our featured speaker was Mark Morgan, founder of StratEx Advisors. Mark has a 30 year history of work with individuals, teams and organizations helping them clarify what they want and focus on getting it. His belief is that solutions to organizational challenges are best constructed to match the unique DNA of the organization. His career has covered engineering, line management, leadership development, business start-up, project management, program management, portfolio management, strategic planning, workshop facilitation and public speaking. Mark has worked with individuals and companies in the high-tech, bio-tech, construction, consumer goods, high volume manufacturing, software, healthcare and internet industries. Mark raised one point during the webinar that I found particularly applicable to a lot of situations. How can we fill the void or avoid the disconnect between strategy and individual projects? 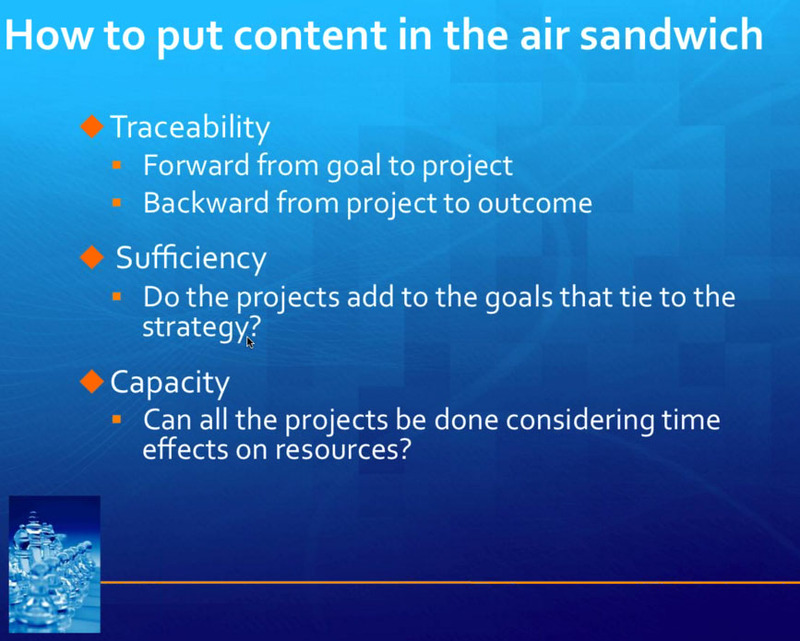 Or as Mark put it, how can we put content in the "air sandwich"? He identified several key characteristics that can help an organization with this goal: Traceability, Sufficiency, and Capacity. Is this a challenge you have faced in your company? How did you address the issue? Share with us in the comments. To enjoy year-round learning benefits such as the webinar series throughout 2012, register for the event today. Readers of our blog receive an exclusive 15% discount off the standard registration rate with code PW11BLOG.